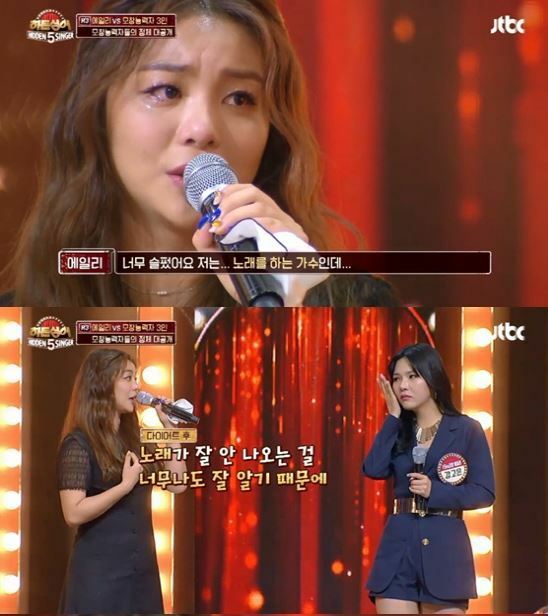 Singer Ailee shed tears while recalling her experience of dieting during the episode of “Hidden Singer” that aired Sunday. “Hidden Singer” is a TV program in which a pop star and impersonators compete in a singing battle while the audience tries to guess the real singer by listening to their voices only. During Sunday’s episode, an impersonator said she had lost 15 kg to become a singer after she saw Ailee had lost weight. In turn, Ailee opened up about her own experience. Ailee said she was very unhappy after losing weight. At the time, she weighed 49 to 50 kilograms, but was hungry all day because she could not eat anything. “I was saddened by the fact that I had to go on a diet to sing and perform onstage,” she said in tears. Ailee also revealed that she could not sing to the best of her abilities after losing so much weight, and described the period as “the most depressing time” in her career. “I decided not to care about how I look. I am happy now, and it is more important that I am satisfied with my singing. The most important thing is to love your own body,” she said. Viewers applauded Ailee’s positive mindset while criticizing social pressure regarding weight loss.